Quantum Energy Systems is an approved installer for products supplied by PassivSystems Ltd.
PassivEnergy Smart Boiler Control is a revolutionary, award-winning energy management service that makes your existing heating and hot water system work better. It helped our cost-conscious customers reduce energy use by an average of 23%*. Professionally installed in a couple of hours and designed to work with oil, LPG or standard gas-fired systems, it will put control in your hands and could put money back into your pocket. Our smart boiler heating and hot water service revolves around the way you live your life. In the past you may have had to guess when you needed the boiler to come on in the morning to make your home more comfortable, and battle with fiddly on/off timers for hot water. Forget all that. Just tell PassivEnergy what you’re doing and the system will take care of the rest. * Statistical saving data from a year long trial between 2010 and 2011 in 25 homes. Intelligent occupancy: really simple scheduling to match your lifestyle. Learning technology: learns how your house operates and takes weather feeds to keep your house perfectly heated and topped up with hot water. Anywhere control: Coming home early? Staying out late? If you have an iPhone©, you can use it to control your home wherever you are. In means there are people at home and that they’re awake. Asleep means everyone at home is in bed. Out means no-one is at home for a while today. Vacation means no-one is at home for more than one day. All you need to do is to tell PassivEnergy where you are. 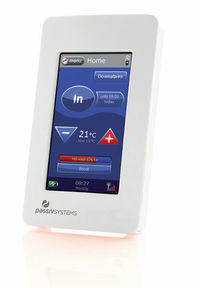 You can set up your home’s daily or weekly schedule and PassivEnergy will take care of the rest. If you then come home early one day, or decide to have an early night, you simply tell the system by pressing the OCCUPANCY button on your Controller. If you have purchased the nifty wall-mounted Occupancy Buttons as part of your system, you can press these instead (most likely to be by your bed and/or your front door). • Check and change the temperature of your home. • Alter your PassivEnergy Occupancy schedule. • Check, set and change vacation settings. • Track how warm it is at home. Please note that your home internet connection must be up and the PassivHub on for the PassivEnergy iPhone app to work. Installation and connection of this product should only be carried out by a suitably qualified person. Tampering with your meter is not only dangerous, but may void your Feed-in Tariff eligibility.